Quincy boys’ soccer goalie Cameron Dingel kicks out after another successful defense of the Trojan goal. The soccer season leaves sweet memories of warm afternoons on freshly cut grass as high school teams tested their skills against one another. The unsung heroes of the game can be the goalkeepers. They can go unmentioned because they are the ones guarding the goal vs. scoring them … usually. 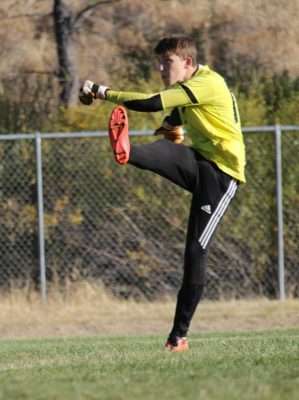 QHS junior Dingel has served the Trojan soccer team as goalie each of his three high school years. As a freshman in 2016, he guarded the QHS boys in a huge 21-game season where the Trojans won the league trophy undefeated, 11-0. QHS went all the way to the final round of the NSCIF championship. There they walked away with a hard-won second place to the Tulelake Honkers. Dingel received player of the game honors twice that season: Sept. 15 against Redding and again Oct. 1 with nine saves in the game, as the Trojans beat the Tulelake Honkers 1-0. Last year, 2017, Quincy won their league undefeated 9-0. Goalkeeper Dingel saw the success of the team fully realized as the Trojans drove their winning streak right into NSCIF championships. This time when they faced the reigning Tulelake team they beat those Honkers 2-0 and took the trophy home for Quincy. Repeating a pattern the QHS fans have come to love, Quincy again won their league this year undefeated in nine games. “He [Dingel] was a cornerstone to the undefeated league run the team made this season,” said coach Prouse. As the Trojans returned to the NSCIF finals as the reigning champions, QHS lost the spot to their championship rivals, Tulelake. “Our only loss came down to a last minute extra overtime goal scored that was not reflective of his play that game,” said Prouse of Dingel. The Honkers then lost to the Mount Shasta Bears, so this year neither team holds the trophy. Beware Bears, just sayin’. Dingel was honored for his skill in the 2018 season as player of the game on Oct. 9 after the second of three Portola/Quincy rivalry games. With 11 shots to the goal, Dingel stopped nine. “I am thankful for his play and leadership he provided to the young athletes that will surely grow thanks to his amazing season,” said Prouse. Icy temperatures now encroach upon soccer fields, freezing each and every blade of grass. Now that rain and snow have come, there is just the quiet waiting through our frozen season before the soccer fields once again emerge in the spring for new teams to conquer. 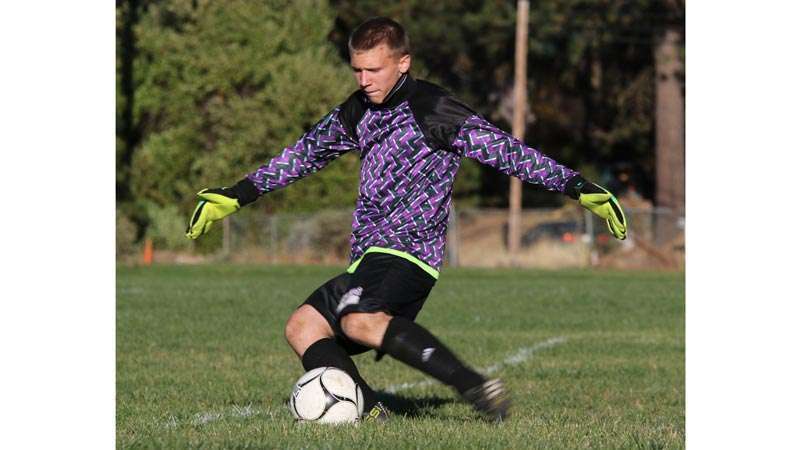 For now it is all over, but here are a pair of memories from the great games and challenges witnessed by Plumas County fans in 2018.